"'There's no heroin here, it's only a Dublin thing' - it's complete lies"
An Irish play tackles drug use head on. WHEN SHE WAS just nine years old, Grace Dyas found a syringe in her garden. That experience led her to travelling the country in her early twenties to find out more about addiction, which culminated in the Theatreclub play Heroin. Now that its recent national tour has been completed, a very special once-off Heroin event will take place on Monday. It will see the creator of Love/Hate, Stuart Carolan, and experts gathering to discuss the issue of heroin in Irish society at Liberty Hall in Dublin. The play itself tackles the issue of drug use in Ireland head-on, taking in a wide sweep of decades across Irish history. Grabbed by the throat is the period from the 1960s to present day, and shaken to see what the years have in common. This latter point, about needles being found where they were previously absent, is what happened in Dublin in the early 1980s, says Dyas. 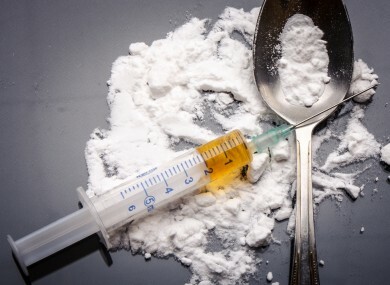 There are some common stereotypes around addiction, particularly heroin use – take the use of word ‘junkie’ – which Dyas says is down to a lack of a national conversation around drugs. Without a campaign on the issues of addiction, how can we expect people to be more informed, she asks. Addiction is across all counties, all backgrounds. It’s more obvious in working class areas because working class people can’t access treatment. If you have a heroin addiction and if you have money, you can go into treatment tomorrow. The play was developed over two years with the help of the Men’s Group from Rialto Community Drug Team, who Dyas met in 2008. They attended all the rehearsals and worked closely with the Theatreclub. Was their contribution helpful? “Rather than helpful, I’d say it was crucial. The piece wouldn’t have been possible to have been made without them,” enthuses Dyas. The play, which recently completed a national tour, has been performed for about five years, testament to its ability to connect with audiences. Funding for the Liberty Hall show was made available thanks to Dublin inner city councillor Gary Gannon. The performance of Heroin and debate wil kick off at 8pm at Liberty Hall on Monday 9 February. Tickets are available through Project Arts Centre, and community rate tickets are available for €5 through Cllr Gary Gannon on 0861780149. Email “"'There's no heroin here, it's only a Dublin thing' - it's complete lies"”. Feedback on “"'There's no heroin here, it's only a Dublin thing' - it's complete lies"”.